Heather Edwards is a pianist/songwriter/recording artist who has performed with many types of bands - from funk and rock to jazz and country and playing a wide range of characters as an actor. 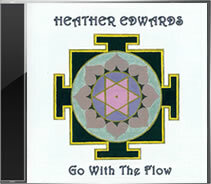 Heather Edwards #5 on Top 10 Charts! Heather Edwards Makes Top 10 For Pop Artist! #2 On Reverbnation For Pop! Old school rock & dance music that will make you want to jump on the dance floor. Infectious melodies and witty lyrics, featuring piano. Life's too short... Go With The Flow.